Below you'll find some detail about what Artist & Builder can do. Please contact Frank, owner of Artist & Builder, via the Contact tab above, for planters, raised beds, benches, structures, and more. Architectural wooden containers for rooftops, balconies, storefronts, commercial sidewalks, decks, front yards, back yards, and every place in between. As a gardener, I understand plants, micro climates, microorganisms, and the effect of these on outdoor woodwork. Most common lumber, in contact with soil and weather, will not last very long. Artist & Builder constructs planters with tree species that show the best decay resistance and stability in wet environments. Clear or knotty Western Red Cedar and Coastal Redwood are popular choices, but I can source tropical hardwoods as well. Interiors can be built with ground contact treated plywood and planks if desired. I've been a gardener all my life and there's nothing like the fresh and flavorful taste of home grown vegetables. For vegetable-growing containers, Artist & Builder prefers to rely on cedar for its natural rot resistance, availability and reasonable cost. 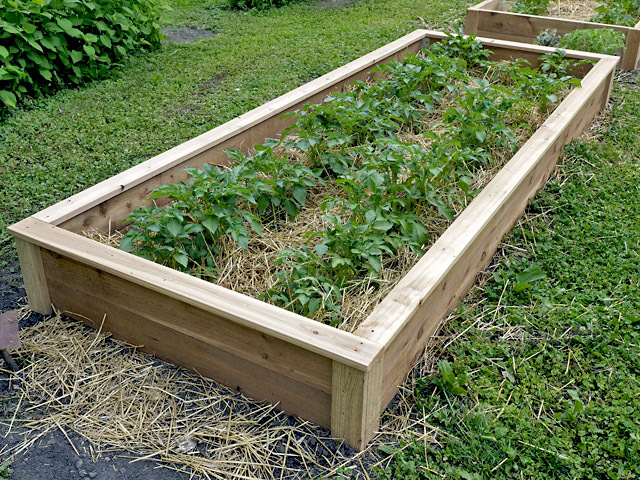 There is little we can do to completely eliminate decay of wooden garden structures over time, but relying on cedar will give your raised beds the best aesthetics at the best cost without compromising the health safety of your vegetables.Artist & Builder can design, create, and install any number of iterations of wood-framed raised beds or vegetable garden structures. Respond to your needs with the right solution for growing vegetables in a raised structure. Click through the older posts (below) or the Projects tab above to see what I have accomplished. Because I am an artist, you will also find a link to my artist page, above and also my garden and landscape blog, Mound. Thanks for visiting and check back again to see what I have been working on. Western Red Cedar Architectural Raised Bed sized 4 foot wide x 10 foot long x 1 foot tall.